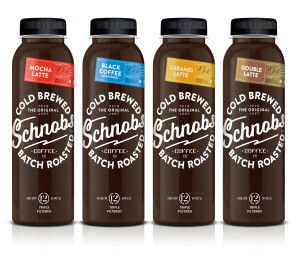 Introducing the latest brand to join the Made family – Schnobs Cold Brew Coffee. Made by Schnobs for total Coffee Schnobs, our cold brew coffee will surprise and delight coffee lovers around Australia. Schnobs is made with 100% Arabica coffee beans that are sustainably sourced from coffee growers in Brazil and Colombia. The whole coffee beans are freshly roasted, ground and cold brewed for over 12 hours every batch. The cold brewing process extracts less of the coffee oils, leaving a strong, bold coffee flavour boasting a smooth finish with low bitterness and acidity. Schnobs is the first widely-distributed cold brew coffee product, available nationwide through Woolworths in four 325ml varieties – Black Coffee, Double Latte, Mocha Latte and Caramel Latte.